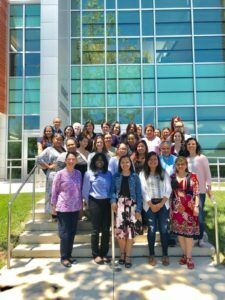 Wye Mills, MD – ChesMRC in partnership with Chesapeake College and as part of the Talbot Language and Cultural Competence Committee held the first ever, on Maryland’s Eastern Shore, 40-hour Certified Community Interpreter Training Program. The Talbot Language and Cultural Competence Committee is a multi-agency collaborative endeavor integrated by agencies such as the Talbot County Department of Social Services, Talbot County Health Department, Talbot County Public Schools, Talbot County Sheriff’s Office, Talbot County Department of Emergency Services, Choptank Community Health System, University of Maryland Shore Regional Health, Easton Utilities, Chesapeake College and Chesapeake Multicultural Resource Center. ChesMRC’s, Lorelly Solano, was responsible for the projects initiatives and the program was a huge success. The initial goal was to have a minimum of 25 participants for it to be successful, it ended with 31-participants enrolled that completed the entire training. The 40-hour training was led by instructor Carola E. Green, a licensed trainer for Cross Cultural Communications. Green came to the United States from Guatemala, has been in the field for more than 20 years and is certified as a federal court interpreter.